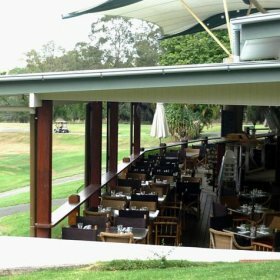 The Hillstone Golf Course at is located next to the Brisbane River at St Lucia. Over eighteen holes the course travels over and around many hills providing a scenic landscape and remaining very popular amongst the golfing community. The Clubhouse and other buildings are positioned at one of the highest points on the property overlooking many of the holes. The club has facilities to cater for large functions and the latest addition is the 100 Acre Bar which accompanies existing bar and dining areas. The 100 Acre Bar is equipped with an open fireplace and dining area with views to attract the public and golfers as they approach the nineteenth hole. 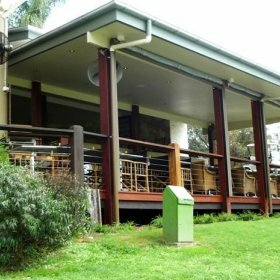 Constructed in a mix of brick masonry and timber including recycled timber posts and balustrades, the architectural structure has proved to be a popular addition. Lambert & Rehbein were engaged to provide structural engineering services for the design and construction of the hillside structure.